Here’s a tune you’ll want to play round the Thanksgiving table! 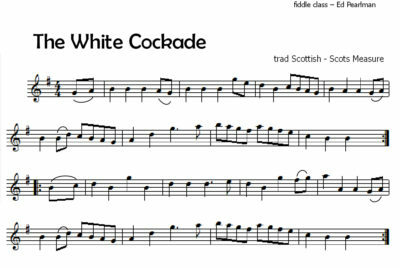 An American classic fiddle tune, “Turkey in the Straw” sounds to me like it came from a type of old Scottish tune called the Scots Measure. 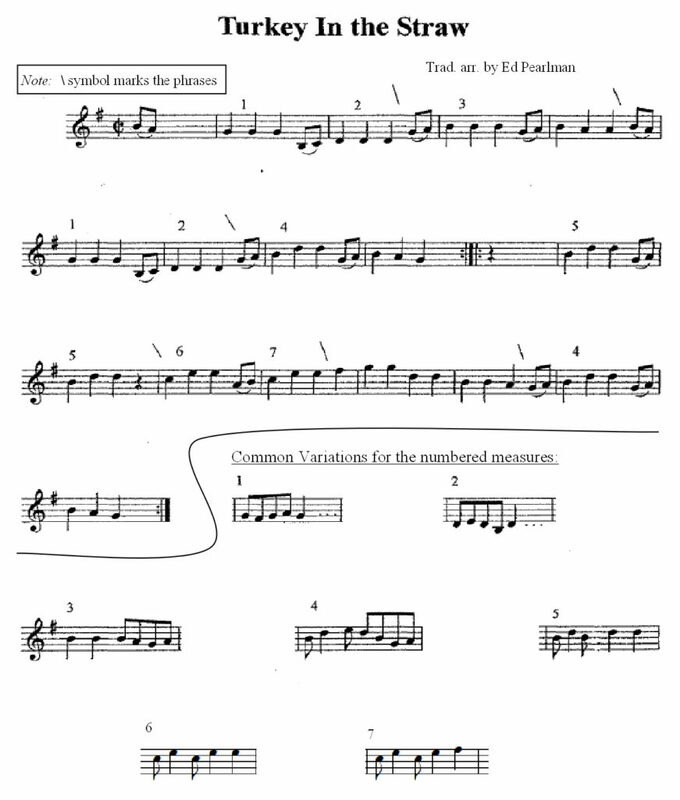 In that spirit, here’s a very simple version of the tune, but if you replace the numbered measures with the variations marked below the tune, you’ll see how this simple version might have developed into the tune we usually hear today. The Scots Measure was a type of dance; there are many old tunes of that type but nowadays we have folded the Scots Measures into other forms such as hornpipes and reels. Below is a typical example of a Scots Measure that’s similar to the version of Turkey in the Straw above — it has the Scots Measure’s repeated pattern of two eighth-note pickup notes leading to three strong quarter notes. There are many tunes of this type and it is easy to see how the basic tune of Turkey in the Straw fits into this pattern, with a little decoration, which I wrote in as “variations” on the basic tune above. Give it a try, and enjoy! It’s not too hard to imagine how a Scots Measure would make its way into the American fiddle repertoire. Lots of American fiddle tunes came over from Scotland in the 1700s with the massive exodus of Scots who had been planted in Northern Ireland for a few generations and then left due to strife caused mostly by landlords and the imposition of the Anglican Church. Another exodus of Scots to Appalachia took place after the Battle of Culloden in 1746. Many traveled to Philadelphia, and from there into the Appalachians and beyond, both north and south. Scottish melodies can be found in American old-time tunes, country songs, pioneer tunes (notice the tune titles in Little Home On The Prairie), and cowboy songs (Scots owned a large percentage of the cattle in western U.S.). Dvorak used a Scots Gaelic song for the first theme of his New World Symphony, a melody he learned in America. You can learn a great deal about this from the book by Fiona Ritchie and Douglas Orr, called Wayfaring Strangers. Thanks, Ed! I’ve a;ways loved Turkey in the Straw and now I know why. Wayfaring Strangers is a fantastic book. Looking forward to your December post. Previous Previous post: Stepping on the Gas!